When I attended the Quest for Sourdough workshop in St. Vith, Belgium (home of the only sourdough library), I filmed many of the bakers as they worked. 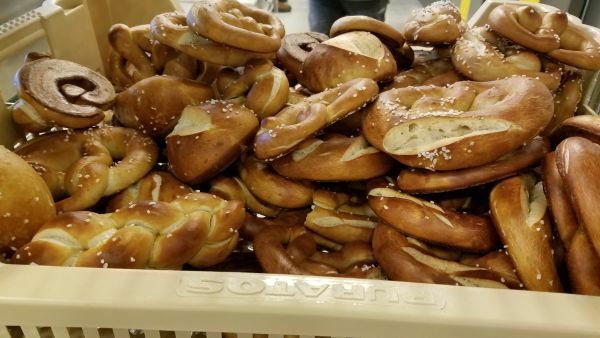 Here are two videos showing how to shape pretzels and the dipping of the pretzel dough in food grade lye. Manfred Enoksson gave the demonstration. At the bottom of the page you will find two formulas for pretzels, one by Manfred Enoksson and one by Manfred with modifications by Guy Frenkel. The formulas will be available to the general public for two weeks and then available only to members after that time. Mix and ferment for 24 hour in the fridge. Shape (90-100 grams dough or whatever suits your fancy) and then let the dough proof until you see about 30% rise. Refrigerate 3- 16 hours (cover with plastic). Sprinkle with coarse pretzel salt and bake at 230C/450F until dark brown (13-15 minutes). 600 grams pasta madre (same as Lievito Madre which is at 50% hydration). 50 g liquid starter (at 100% hydration). 600 g AP or bread flour (I used half fresh milled). Use extreme caution when working with lye – always add the lye to the water, not the other way around. Use gloves and eye protection. Stand back and look away when you are stirring the lye (avoid lye fumes)(or try using baking soda water, it’s safer).